One of the main reasons of mortality due to respiratory diseases is chronic pulmonary disease (COPD). The highest mortality rate due to respiratory diseases in Slovenia is recorded in the Zasavje region and the lowest in the Central Slovenian region (2009-2015). Mortality due to respiratory diseases is decreasing; in the period 2000–2015, it decreased by 14.87%, from 73.9 to 63.3 per 100,000 inhabitants. This indicator shows mortality due to respiratory diseases (MKB-10: J00 do J99), which is subject to various risk factors, including polluted indoor or outdoor air. However, identification of links is not simple. Nutrition, lifestyle and other environmental and social factors can be important. Mortality due to respiratory diseases is an indicator enabling indirect assessment of exposure to adverse environmental health factors. Measures to promote efficient energy use and renewable energy sources in heating of buildings (district heating and gas supply; measures in the field of household heating devices; local energy concepts; provision of information and encouragement of the reduction of heat loss in buildings; accurate register of small combustion installations). Measures in the field of transport (Implementation of transport policies in cities – more walking and cycling, increased use of public transport, restrictions on the use of cars; traffic management on state roads and in city areas; measures to reduce pollution from vehicles used in public passenger transport, public utility services and city administration by introducing cleaner vehicles; promotion of electric mobility; measures to reduce from roads). Measures in other fields (introduction of environmental management systems; reduction of fugitive emissions; reduction of dust from landfills, construction sites and road surfaces of corporate entities; expanding green areas in cities; setting up an air quality website; education/raising awareness about air quality). Respiratory diseases represent more than 6% of the global burden of disease and cause more deaths and disability than all malign diseases combined, representing 13% of all hospitalisations. Respiratory diseases can be caused by risk factors such as polluted air, cramped living conditions and poor housing quality. Research has shown that long-term exposure to polluted air increases the likelihood of developing respiratory diseases, such as allergies, asthma, chronic obstructive pulmonary disease (COPD) and lung cancer, especially in children and among the elderly (National Institute of Environmental Health Sciences, 2007). High prevalence of smoking (environmental pollution with tobacco smoke) and low vaccination coverage against influenza and pneumococcal infections are also important factors of mortality due to respiratory diseases. Some of the above-mentioned factors are closely related to socio-economic deprivation. In addition, poverty is related to a twenty-fold increase in relative burden of lung infections that affect very young and very old segments of populations (Steward, Sounders, Kamm, 2008). Studies carried out in European countries have shown that children from low-income families are twice as likely to be exposed to tobacco smoke than children from higher-income families (UN Regional Information Centre for Western Europe, 2010). An epidemiological study carried out in England showed that the increased hospitalisation due to respiratory diseases is closely linked with inequity (Hawker, Olowohure, Sufi, 2003). Poor living conditions, including insufficient heating, poor aeration and cramped conditions, are among some of the main risk factors for respiratory diseases as well. Poor insulation contributes to a higher mortality rate due to respiratory diseases in wintertime (Clinch, Healy, 2000). Poor aeration and cramped conditions cause the spread of respiratory diseases, such as influenza and tuberculosis, thus increasing the burden of respiratory diseases. Mortality due to respiratory diseases in Europe is decreasing. It dropped by 23% in the period 1999–2008, from 62.9/100,000 inhabitants in 1999 to 48.5/100,000 inhabitants in 2008 (WHO, 2009). Such a pattern occurred in many countries with a high mortality rate, such as Ireland and England. 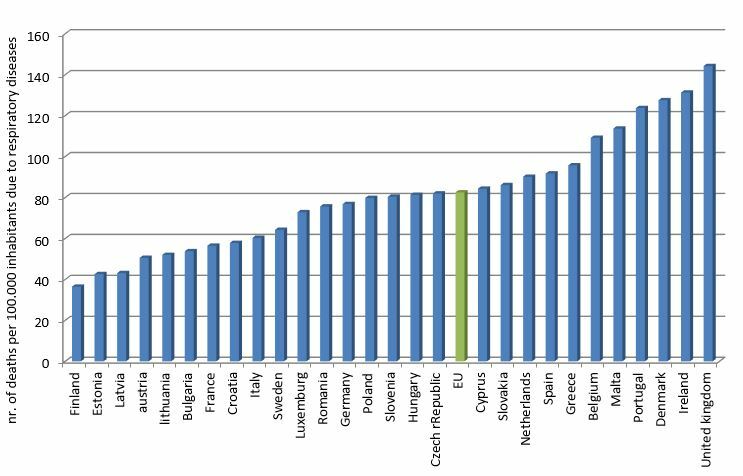 Nevertheless, the rate in these countries remains considerably higher than in other parts of Europe. It has been established that Ireland has one of the highest winter mortality rates (Healy, 2002). Extreme weather conditions cause the aggravation of respiratory diseases, such as asthma and pneumonia, although this can also be a consequence of other factors, such as hypothermia or poor housing conditions. 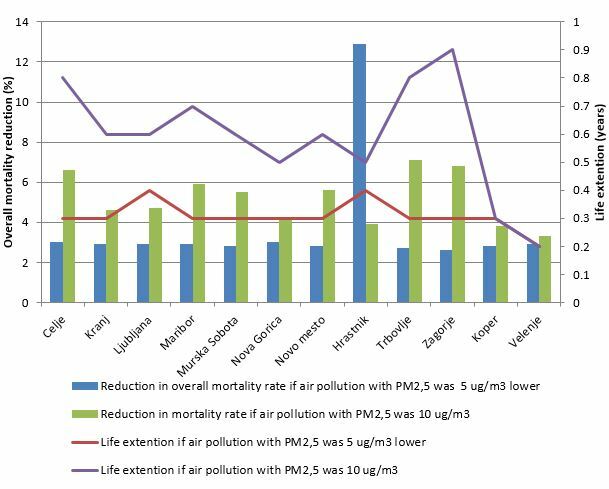 Mortality due to respiratory diseases is closely linked to polluted air and fine particulate matter, including sulphates, in concentrations above 74 µg/m3 (Air quality guidelines, 2005). A study conducted in England showed that a 10 µg/m3 increase in sulphur dioxide in outdoor air was associated with a 102% increase in the risk of infant deaths (Hajat, Armstrong et al, 2007). In 1999, a Council Directive relating to limit values for sulphur dioxide, nitrogen dioxide and oxides of nitrogen, particulate matter and lead in ambient air was adopted (Council Directive, 1999). Consequently, a decrease in mortality rates from 62.9/100,000 inhabitants in 1999 to 53.9/100,000 inhabitants in 2010 was recorded. 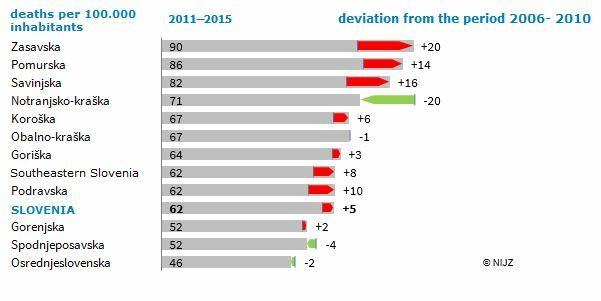 Although this decrease may be a result of other factors, implementation of the Directive is the most likely reason.